News / The Return of RETURN OF THE DAPPER MEN! The Return of RETURN OF THE DAPPER MEN! Everything began with a single breath. 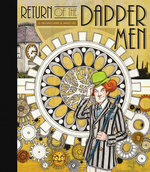 Top Shelf is delighted to reveal details of the rebirth of one of this decade's most acclaimed graphic novels: Return of the Dapper Men by Jim McCann and Janet Lee. Their whimsical clockwork fairytale, which won the Eisner Award for Best Graphic Novel some years back, now comes to Top Shelf in a deluxe new edition designed by Eric Skillman and filled with bonus content. Even better, the Dapper Men saga will ultimately be expanded into a trilogy, with Book Two and Book Three planned for subsequent years. Check out more details and preview images from this 144-page deluxe hardcover, which stands a hefty 9.75" x 11.25", and check in with your favorite shop to pre-order it! Background by Elio. Top Shelf Productions® and the Top Shelf logo are registered trademarks of Top Shelf Productions, Inc. All rights reserved.